Take an orange flag Chao Phraya Express Boat to Tha Chang pier. Alight and cut straight through the pier market. Cross Maha Rat road. Walk along the white walls on Na Phra Lan road and on your right will be the entrance into your first stop. 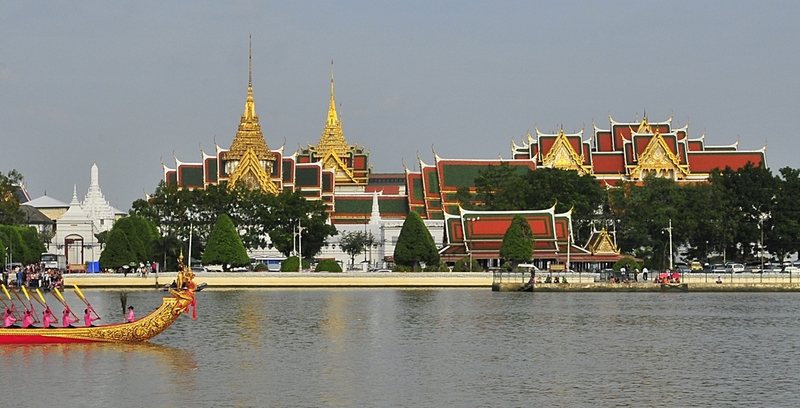 This large complex is the heart of Bangkok’s history. It is the legacy of King Rama I and is considered by many to represent the pinnacle of Thai architecture. Marvel at its opulence and make sure the see the Emerald Buddha, the palladium of the country. Founded by Italian-born art professor Corrado Feroci in 1943, Silpakorn University is the country’s premier institution associated with the study of Thai fine arts. The Art Centre showcases exhibitions of both faculty and rising talent in the student body. Check out the website for information on exhibitions before going. Restored from a group of riverfront shophouses, Tha Maharaj shopping center has become an example of developers trying to revitalize existing spaces into open-air gathering spots. Satisfy your hunger and thirst here at a variety of shops. Known throughout the city as the go to place for Thai superstition, Amulet Market offers locals protection and blessing from the spirits in the form of trinkets. Vendors line the alleys selling statues, amulets, bracelets, and others. Fortunetellers can also divine your future if you are willing to pay the price. Restaurants in this area have provided affordable meal options for nearby university students for decades. Take the opportunity to try a variety of dishes and treats by local vendors and refuel yourself for the rest of the walk. Thammasat University is known as one of the country’s most progressive academic institutions and often a top choice for aspiring students. The Dome Building is the university’s first structure when it was founded and is now a symbol of the school. The architecture is of modern and gothic revival styles with Thai influences. Walk through its halls to get a sense of the university atmosphere when it first started. This standalone café in recent years has become bicyclists haven. Those into cycling or helping the cycling movement move forward in the city often meet here and work closely with the university on volunteer work. Pick up your iced drinks here to cool off. Sanam Luang is one of the city’s most significant locations. Although it is a simple open field, Sanam Luang has been the site of important events throughout history, including royal ceremonies and functions. The field also plays an important role as public space, where kites were once flown locals for leisure and protests took place. This wonderful complex of buildings was converted from a royal palace to a museum to house one of the largest collections of Thai art and artifacts. History buffs will enjoy the displays of old works of craftsmen and accompanying captions explaining their origins. Thailand’s participation in World War I often goes unnoticed in world history. During wartimes, Thailand deployed an expeditionary force to fight on the side of the Western powers. This monument is dedicated to Thais who lost their lives in battle. As a result of Thailand’s contribution in the war, the country became a founding member of the League of Nations. A neighborhood feature for many years, this restaurant is famous for its Thai version of a Vietnamese noodle dish. Kuay Jab Yuan was introduced to Thailand via Laos in the northeast region before reaching the capital. The slippery rice flour noodles in savory thick broth is the dish’s distinguishing trait. This walking street is filled with bars, vendors, and massage establishments that cater to international backpackers. Pick a spot to rest and people watch or make new friends who are also visiting the country. Khaosan Road is the original backpacker’s paradise and was part of the Hippie Trail from Europe to Asia. It has since lost its hidden and quaint charm and have transformed into a more developed street with business savvy establishments. It continues to draw backpackers who help to retain its spirit. Wat Bowonniwet Wihan Ratchaworawihan is the temple of choice for the current ruling Chakri dynasty. Royal princes and kings have studied and entered monkhood at this house of worship. The shrine hall contains a Buddha image that dates all the way back to the 1300s. Khao Chae is a Thai delicacy often associated with afternoon tea. Not completely a dessert and not completely a savory dish, this rice soaked in cool water is extremely popular during the hot season. The proper way to eat Khao Chae is slowly taking small bites of the side dishes and savoring the flavors with the rice. The area where you are is known as Banglamphu, bounded by Phra Athit road, Wisut Kaset road, Dinso road and Ratchadamnoen avenue. Passionate residents rallied together to preserve and renovate a community building into Pipit Banglamphu. This museum serves to show visitors the area’s communities, history, way of life, and more. Another popular neighborhood eatery, Roti Mataba specializes in roti or flatbread from India. You can choose from a variety of side dishes to complement your roti and palate. Fort Phra Sumen is one of the two remaining forts in old Bangkok. 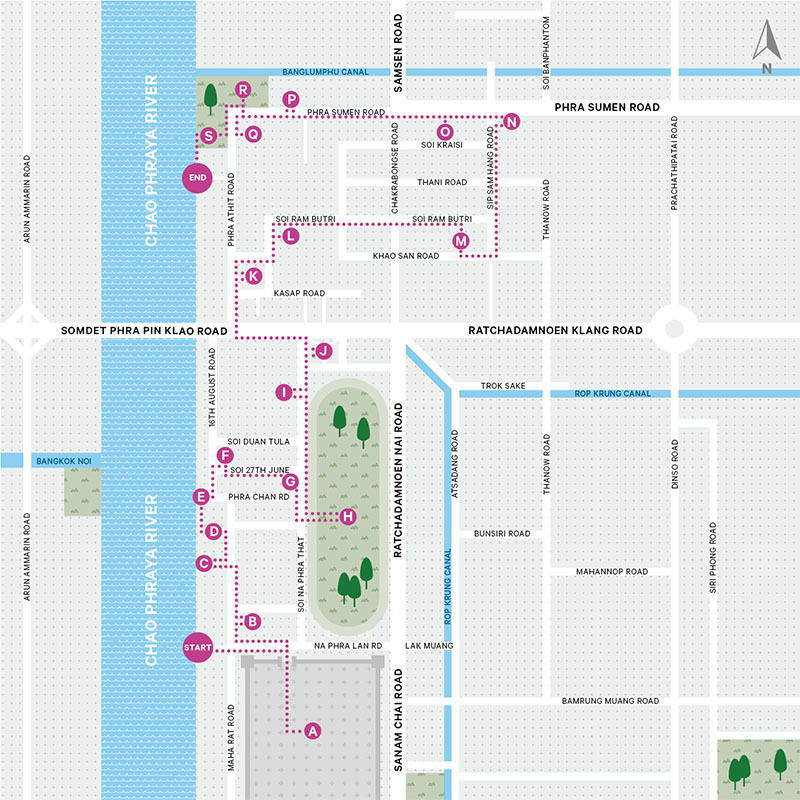 A total of fourteen used to encircle Rattanakosin Island. One of the rare green spaces around Bangkok, this public park serves both residents and tourists as a resting spot. Finish your walking tour here and wind down before going to your next destination. To get to your next destination, walk toward the river and find a pathway on the west corner of the park leading out to Tha Phra Arthit pier. Board an orange flag Chao Phraya Express Boat to your next stop.